Sometimes love isn’t all you need. At least this seems to be true in the case of Mr. Gold (Robert Carlyle) and Belle (Emilie de Ravin). Though true love’s kiss saved Snow White, even after she had taken a memory-stealing potion, the same did not hold true for the lovelorn Mr. Gold. Perhaps their love isn’t quite as true as Snow and Charming? It’s a bold move for the show to throw such a huge wrench in their romance. I like that the show is willing to push things in unpredictable directions. This episode, “In the Name of the Brother,” built tension and drama into the storylines. As Mr. Gold desperately tries to make Belle remember who he is, the others try to figure out what to do with the mysterious stranger that came crashing into their town. He is critically injured, and a drunken Dr. Whale (David Anders) is the only one who can save him. Well, Mr. Gold could have used his magic to save him, but he refused. It seems that Dr. Whale is the only doctor who works in the Storybrooke hospital. It seems strange, but then again, this is Storybrooke. The flashback sequences provide us some background on Dr. Whale/Dr. Frankenstein. For these segments we do not go to Fairytale Land as usual, but to the black-and-white realm in which Frankenstein lives. Rumpelstiltskin had visited Dr. Frankenstein in this realm because he not only wanted the power of magic, but the power of science. Adding Rumpelstiltskin to the world of Frankenstein turned out to be a good thing. For one, it separates this Frankenstein story from Mary Shelley’s classic novel. Instead of following the novel, this show pretends the characters live in some kind of alternate reality. While I found it jarring when it appeared earlier this season, I felt they made this storyline work in the context of the show. I’m not going to say I’m not nervous about where adding other story realms might lead, but since that is now a solid part of the show, I can only hope they do a good job weaving everything together. Henry (Jared Gilmore) himself pointed out that Dr. Frankenstein was not a part of his book, and he wondered what other characters might show up. What I would like to know is how Dr. Frankenstein ended up being affected by the curse. Was he in the enchanted forest at the time, or were other realms somehow affected? I’m kind of hoping there is still a little more to Henry’s book that hasn’t been explored yet. The book provided some mystery, as well as was the mechanism that tied the storylines together. One thing I was reminded of is, why didn’t Henry know who Mr. Gold was? In the first season he tells Emma he doesn’t know who Mr. Gold is in the context of his book. Was Rumpelstiltskin not in the book? If he was, it seems it would have been obvious to Henry who he was in Storybrooke. Maybe Mr. Gold/Rumpelstiltskin was powerful enough to keep himself out of the book. He certainly seems to have his secrets. In this episode we learn he had a possible romantic past with Cora (Barbara Hershey). That’s a little unnerving. His romance with Belle brings out his good side, but a past romance with Cora can only be the opposite. Cora is bad through and through. She even makes us feel sympathetic towards Regina (Lana Parrilla). Clearly Regina has many parental issues, and Cora’s return strips her of her authority. When Cora appears, Regina is reduced to a scared child. What Cora has up her sleeve remains to be seen, but I’m looking forward to finding out. In the meantime, an increasingly angry Mr. Gold calls on Emma to pay up on the favor she owed him in their bargain for Cinderella’s baby. He wants her to travel with him to find his son. I’m not exactly sure why he suddenly wants her to go. He had been prepared to go off on his own. Maybe he thinks Emma is more real-worldly than him. Just as in the last episode, it’s hard to know what to think of Mr. Gold. It’s hard not to feel sorry for him when Belle breaks his prized teacup, but a short time later he is threatening to kill everyone (including young Henry) if he doesn’t get his way. Again, I think the show has been on an upswing. 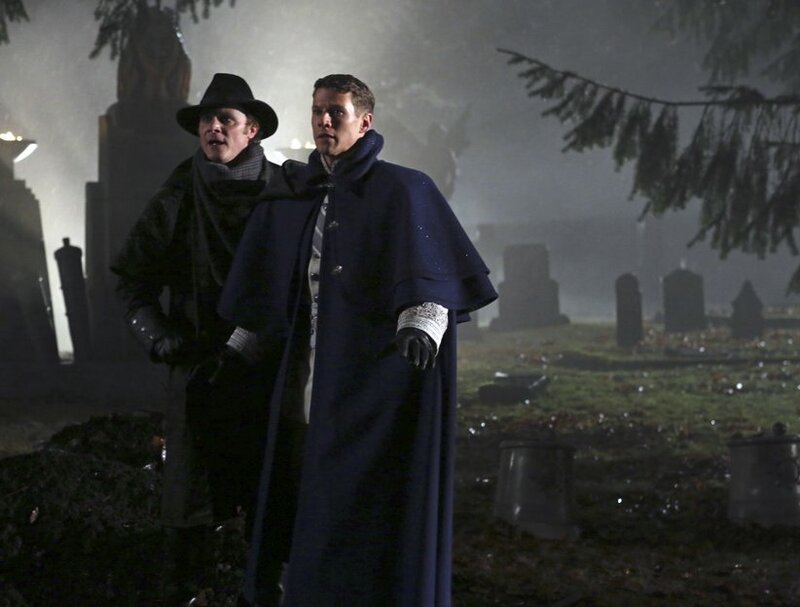 The preview promises some unexpected changes in the works for the people of Storybrooke. I’m looking forward to finding out what happens next. I’m also curious to see what other Star Wars references they incorporate (this episode, Emma’s ringtone happens to be John Williams’ famous main Star Wars theme). Henry hinted that there maybe other books the Storybooke characters came from. I hope they don’t get us confused like they did with Lost. Very good episode! I wonder what drama Cora has in store. I have a feeling she can return Belle memory. Yes, I hope they don’t go too overboard with other kinds of storybooks. I think it’s safe to assume with Henry’s comment that we will be seeing something new soon though. I agree, the Cora storyline is good. I think she might be able to return the memory too, but at what price? I had to watch last night episode again. I have questions on a) They brought a twin brother in for the Prince. b) The giant’s storyline felt like a last minute throw in and what’s up with Mr Gold ?? ?